Above photo, 1960s, kindly sent by Michael Mirams. This has been identified in Barry J White's list of Thanet's public houses and hotels 19th and early 20th century. I believe that this pub was originally the "Saddler" prior to 1877 and changed name again to the "Saddler" again, some time in the 1970s. Thanet Advertiser. Saturday 03 February 1877. 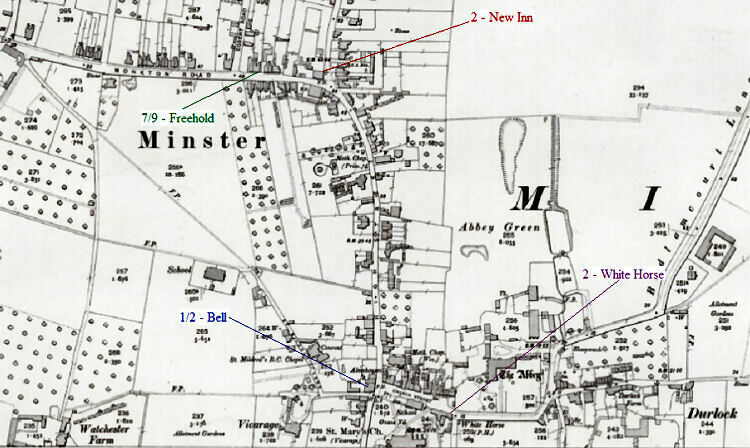 James Mills Setterfield was charged with being quarrelsome on licensed premises at Minster, on the 20th instant, and also with refusing to quit the same premises when requested to do so. Algernon Golder, the prosecutor, said he would be willing to withdraw the charge if the Bench would allow him to do so on defendant promising not to visit his house again. Mr. Robinson, who appeared for defendant, said the case was a very trumpery one, and he was not surprised, therefore, that complainant wanted to withdraw. The Magistrate said the better course would be for the parties to go in to the adjoining room and endeavour to settle the matter. Neither complainant or defendant, however, were inclined to act upon this suggestion, and the former expressed the opinion that the case had better proceed. Mr. Robinson asked that all witnesses might be requested to leave the court. Algernon Golder, the complainant, then deposed I am landlord of the "Freehold Inn," Monkton Street, Minster, which is licensed for the sale of beer. Defendant came into my house, about 8 o'clock, on the evening of the 20th instant, and asked for a glass of beer. My servant served him, and he then asked her where the boy had put a certain pigeon, and the girl told him she did not know. I heard this conversation. Defendant then said the girl was a _____ liar. I had heard the defendant come into the house, and I listened to what he said, and I expected there would be a little disturbance. When defendant called the girl a liar she left the bar, and came into the room where I was. Defendant then sang out "Where's Golder?" I then went to the bar, and defendant said, "I want the pigeon, old man." I told him I could not think of giving it to him, for I did not believe it was his. He said he should not leave the house until I gave him the bird, and he said he should sue me and enter an action against me for the pigeon. He said I was a rogue, a thief, and a liar, and he called me everything he could think of. He said I was even worse than a thief, for I had been buying stolen goods. I then asked him to leave the premises, as I had explained to him previously how I had become possessed of the pigeon. He said he would not go. I told him I should put him out if he did not go, and then pushed past him and opened the door, and tried to put him out. He struck me several times, and I could not succeed in getting him out. I then told my wife to go and fetch the policeman while I held defendant. Defendant then said if I would leave go of him he would go out like a man, and I accordingly left go. He then went out, and afterwards challenge me to fight. In cross examination by Mr. Robinson, complainant said the pigeon in question had been shot, and a labouring man who was in the habit of having his dinner at his (complainant's) house bought it there, and Mrs. Golder bought it off him for 6d. for her little boy, not knowing whether it would live or not. The bird, as it happens, lived, and defendant claims it is his; but he could not say the colour of the bird which he had lost. Defendant had said he would pay the same as was given for the Pigeon, and wished complainant to let the bird fly on purpose to see whether it would not fly to his defendants house. Complainant having no witnesses, Mr. Robinson address the bench on defendants behalf. He said the defence was that defendant was not so quarrelsome, in any case, as to justify a refusal to quit the premises, and, in the next place, if they were a quarrel, it was brought about by the prosecutor himself. He should submit also that case did not fall within the meaning of the act. The section of the act under which the case was brought was passed to prevent drunken, violent, and quarrelsome persons disturbing the general peace of a number of people, and for the protection of the licence victualler and the public generally. Therefore it was a public Act passed for the public good, and, as such, it could not be made use of by a landlord for a private purpose, and in a private quarrel between himself and another person. Defendant was perfectly sober, and what transpired was a simple quarrel. Mr. Robinson was then proceeding to detail the facts as they would be sworn to the by defendant, but the Magistrates stopped the case, and said they had come to the conclusion to dismiss the summons. Mr. Robinson applied for costs, but the Magistrates would not allow these. Thanet Advertiser. Saturday 02 October 1880. Mr. C. J. Mercer applied on behalf of Henry William Court, beer retailer, for an additional licence to sell wine on and off the premises known as the "Freehold Inn," Monkton Road, in the parish of Minster. The service and posting of the formal notices having been proved, the applicant was sworn. He said he had daily applications for wine and for bottles of wine which he was unable to supply. The rent of his house was £30 per annum, and he had three rooms which were thrown open to the public. In the summertime he had visitors stopping at his house who asked for wine, and numerous pleasure vans passing the Inn. Supt. Kewell, in reply to the Bench, said the house has been well conducted, and the applicant bore an excellent character. From the Whitstable Times, 29 September, 1900. The East Kent Coroner (R. M. Mercer, Esq.) 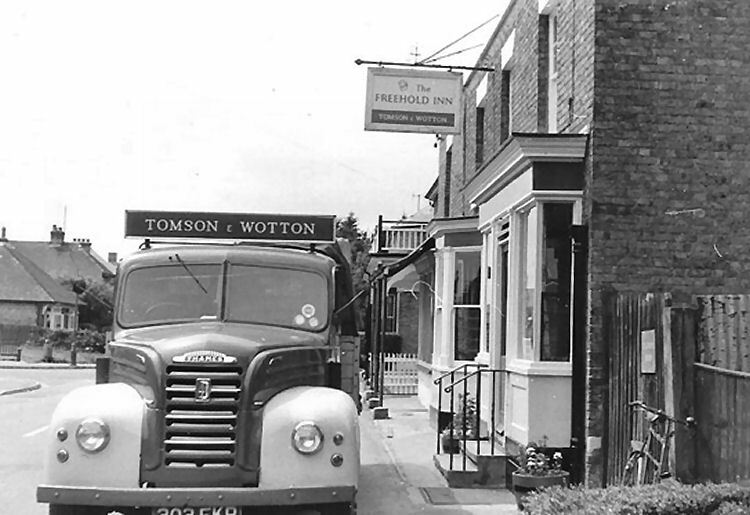 held an inquest on Monday, at the "Freehold Inn," Minster, touching the death of Leonard Read, aged 61, of 6, Augustine Road, Minster, night watchman on the Minster drainage works. The deceased was employed by Messrs. Paramour and Sons, of Margate, as night-watchmen at the drainage works. He was found by a labourer named Thomas Fagg at two o'clock on Saturday morning lying in a trench face downwards. When got up, the deceased was stiff and cold, and had apparently been dead three or four hours. Thanet Advertiser. Saturday 19 March 1921. Vicar and Publican Seek Council Honours. Three nominations were received on Thursday for the election of two Minster representatives on the Thanet Rural District Council. The two retiring members, Messrs, J. T. Ferrier and H. Cobb, did not seek re-election, and in their place were nominated the Rev. W. G. Boyd (Vicar of Minster," Lieut-Com. Godfrey Cecil Echlin, of Letherton, Monkton Road, who is well known for his interest in the cause of the ex servicemen of the district, and Mr. Herbert James Smith, licensee of the "Freehold Inn," Monkton Road. There is yet time for one of the candidates to withdraw in order to avoid a contest.